Simmons TruEnergy Noelle Mattress & Soft Latex Foam Topper. I recently bought a Queen sized Simmons TruEnergy Noelle from a local retailer. The bed felt comfortable at the store and I spent a considerable amount of time trying out different mattresses. I really liked the support and comfort that this mattress offered in the store. When I got my new mattress it was much more firm than the model in the store. I called the mattress store and they told me that I should give it some time as there is a “break in period”. I have been sleeping on the mattress for two weeks now and it is a bit more comfortable, however when I wake up in the morning my neck and shoulders are sore. My previous mattress was a Spring Air Four Seasons Back Supporter. This is a pillow top model that is 15-years-old. My hips used to hurt on this bed. My hips don’t hurt on the new bed but now I have shoulder and neck pain, which I have never had before. I am thinking that I will return the mattress to the store. I am not sure if I will exchange it for ask for a refund. I was thinking that I would get another pillow top but I have been reading the information on your site that says that pillow tops do not maintain their shape and comfort for long. Do you have any suggestions for someone like me? I have considered latex foam but it seems to be really expensive and is likely out of my budget. I just want to be comfortable without being in pain. A queen size 2" soft latex foam topper will run you $349.99. It's the best money you'll ever spend. Add it to the mattress you have and you'll be good to go for many years. Latex Foam Mattress Toppers and Pillows for neck pain. My son has a Simmons Tru Energy Brielle plush firm. Do you recommend a latex foam topper as well or should the plush firm be good but still have the support? He is 6 and weighs approximately 58 lbs. Also my parents are 69 and 68 and are looking for a new mattress and I told them to go thru you. Probably a black Eva with a organic 2 in latex topper correct? Do you have a link to organic latex topper? They are both under 200 lbs but dad has herniations in his neck and low back as well as a bad shoulder. Mom is great. Any recommendations would be appreciated. A latex topper for your son's bed seems unnecessary at this time. When he gets bigger, say around the age of 12, add a 1.5" layer of Dunlop latex. This will absorb much of his body weight and will extend the comfort life of the mattress....allowing him to use that same mattress until he is grown and gone. It wouldn't hurt to get the latex topper now, but it just isn't necessary yet. If just using the latex topper and not the cover that comes with it, it's 100% organic from Ever-Eden. The Pure Latex Bliss all natural toppers are finished in a beautiful organic cotton cover and use a thin layer of wool as a natural fire barrier. These finished latex toppers are also 100% organic. Here are links to both. I have an all latex pillow that is made of finely chopped Talalay Latex from pure bliss. They call it a latex/down pillow. It has no down in it, but can be easily manipulated like a down pillow, to fit precisely the way you want around your head and neck. I use one at home for the severe arthritis I have in my neck. It is the only pillow I've ever used that relieves the pain. I would suggest this for your dad. Here's the link to that. I have a Serta Ceremony mattress and the foam just crushes down and flattens out on me. I sleep on the side and wonder if the Simmons TruEnergy Noel might support better and give pressure relief without smushing down? I suppose you, like most people, view the major "S" brands as being equal. The fact is, Serta makes a third rate product...true for the past 30 years. In other words, almost anything is better than Serta. When choosing a Simmons, it's important to stay with any of the "firm" choices. Their plush models are always a problem....using too thin a gauge of wire for the coils. The heavier coils in the firm models keep their shape much better. A plush/firm gives you comfort and support. The Brielle plush/firm, is a good choice. They all wear eventually. But, this Brielle will out perform anything that Serta makes. Because the coil system is the same in all the Beautyrests, they will all feel similar. have changed 3 times since then. than you want. You can't firm up a mattress that is too soft. you will always have the ability to tweak it the way you like. Error on the side of too soft, and you will find yourself stuck. the link. You can order on line. ONLY TWO DAYS LEFT! Simmons Beautyrest FREE Box Spring Event! 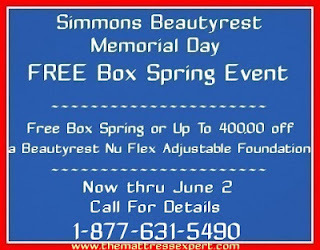 Don't miss out on the Simmons Beautyrest FREE Box Spring/Foundation Event! Simmons Beautyrest FREE Box Spring Event! 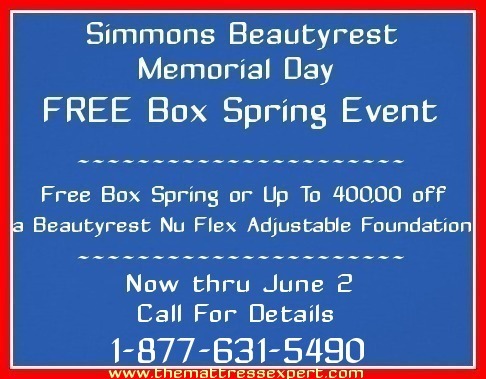 Don't miss out on the Simmons Beautyrest FREE Box Spring Event! Simmons Beautyrest FREE Box Spring/Foundation Event! Simmons Beautyrest Memorial Day Free Box Spring Sales Event Going on NOW! Receive either a FREE Triton foundation box spring or up to $400 off a Nuflex Adjustable Foundation when you purchase a Beautyrest TruEnergy, Beautyrest Black , Beautyrest Recharge World Class or ComforPedic from Beautyrest. First of all let me compliment you on a great site and overall resource. I am looking at the following mattress from another site. 1. What are your thoughts on overall quality and comfort? 2. Do you offer it and what do you call it? 3. How much for your equivalent for mattress only shipped to 38017? 4. How does it compare to the Simmons Black Ansleigh plush/firm mattress you often recommend? We have the Adalee by the same name. It's a fine choice. The padding in both lines is, essentially, the same. The black line uses a much stronger, triple strand coil in half, (every other row)....a good buy for the small difference in price. My wife and I are heavier and we chose the Black Ansleigh in plush/firm....to which, we added a 2" latex topper. It's the topper that makes the difference in having a sleep system that doesn't sag and minimizes even body impressions over years.